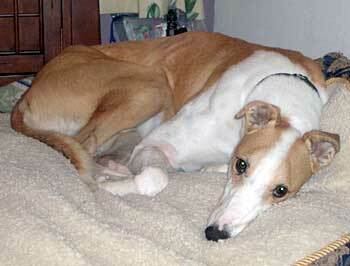 Forest is a stunning almost 2-year-old fawn and white male, born January 2004. Forest came in as a stray from the Fort Worth Animal Control, and his tattoos are in the process of being identified. When Forest arrived, he had several large open wounds that were quite severe  the worst being on the crook of his right elbow. Most of them are almost healed at this time. 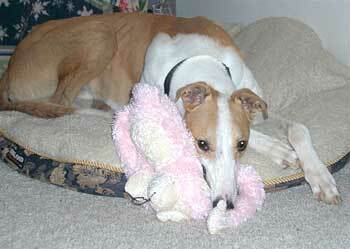 He is living in a foster home with other greyhounds and a cat. Forest is small animal and cat tolerant. Forest is a very handsome, very easy-going big boy who would fit right into almost any situation. He is so easy to have in the house; he doesn't get into anything or exhibit any undesirable behavior. Forest is just happy to snooze on a soft dog bed in a room with you. He is like a big snuggly teddy bear that you can love and hug to your heart's content. Forest loves to eat. He loves his food and treats. He is getting extra of both right now as we are trying to put a few pounds on him. He loves to have his neck and ears scratched. He is just discovering toys and has started carrying them around and tossing them in the air. It is so cute. He sleeps on a dog bed on the floor in my bedroom; he sleeps all night without hardly moving at all. When he has to go potty, he has barked a couple of times by the back door to let me know. But he usually just goes out with the other dogs at our house. He has not marked or had accidents in the house. He does fine with the other dogs and the cats in our house. He does not interact with them very much, so I think he would be okay as an only dog. Forest stays in a crate while we are not home. He does not mind being in his crate and he goes into it sometimes to take a nap even when we are home. He loves to go on walks and seems to have a bit of a protective nature. He will growl a little when he sees a strange dog, but will stop and just continue walking when you reassure him that it is okay. 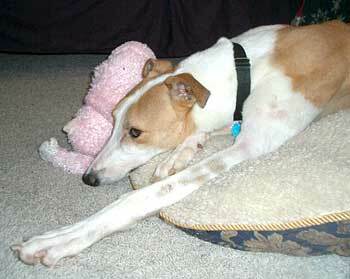 If you are looking for a very sweet, calm, and loving greyhound, Forest might be just the boy for you.